I've had bad acne since I was about 15, I'm now almost 25. It started as 'bad acne' and moved onto cysts and puffiness, horrible painful lumps under the skin, millions of whiteheads, blackheads, postules, you name it. It felt like a never ending trauma no matter what I did to try to stop it. - Homemade/Store-bought facemasks - (Honey and oat lotions and potions and all the rest) Didn't notice any change. - 'Natural/cream remedies' - Toothpaste, Tea tree oil, witch hazel, sudocream, silver serum, spot zappers, aspirin, honey.. etc. You name it, I've rubbed it on my face night after night to no avail. - Anti-acne face washes - (Simple, Neutrogena, Clearsil) Seemed to do absolutely nothing to help. Whether I clean my face with a face wipe, or do the full process of cleanser, toner, blah, blah, it seemed to make no difference. - The Regimen - A nice idea, but no results (and expensive because I had to have it sent to the UK). - Miracle tablets - (Weirdly named superfood supplements) Taking pills containing all sorts of vitamins and minerals shipped straight from the bottom of the amazon rainforest or the bottom of a drug dealers basement floor for all I knew. Potentially lethal, can't really believe I ordered random pills off the internet and took them like medicine. No success and luckily no harm done. - Benzoyl Peroxide gels - I've tried a few different brands, mostly used Duac and Epiduo. Yes, they start to dry up your spots but they do nothing for cysts under the skin and they don't solve the problem. - The Contraceptive pill - Made my skin much worse with some brands (Dianette), others seemed to have little to no effect (Yaz, Yasmin, Celest), perhaps I never stuck it out long enough, but in my opinion they never made much difference and certain brands gave me slight mood swings. Also, at this point in my life, I don't need them for the job they were designed to do, so why fill my body with more stuff it doesn't need. - Antibiotics - I've tried many different types and brands of antibiotics (doxycycline and limecycline were popular from memory), lots of courses, and yes I've seen some slight success, but that's because it stops your skin producing sebum. It's a roundabout way of getting results, but you can't stay on them forever and it's not long-lasting once the course stops, or even particularly effective in the first place. - Accutane - It was horrendous for the 4 months I endured it, but there were real results, well, for a short while at least. A few months after my course ended and I thought my skin was going to be relatively okay - still far from perfect - the cysts returned and the redness continued until I was back to square one, minus a lot of dry skin, pain, unhappiness, time and cash. It's a nasty drug and I'm sad I had to put myself through taking it. Being ashamed of your acne may seem superficial, but there are more times than I can count where instead of enjoying myself with friends, I've stayed home and cried because I just couldn't face going out into the world with such a hideous face. - Giving up dairy - I don't know how it works. I've read and read and read and can't find a definitive answer, the hormones, an intolerance? For me, giving up dairy has cleared my skin up from one end of the spectrum to the other (check the pics). 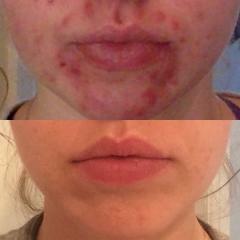 It's the cheapest and almost most ridiculous treatment I've tried, but I'm literally blown away every single morning I wake up and don't look at myself feeling disappointed when I look at my face in the mirror. Please try it. And make up your own opinion. People say diet can't change your skin and for a long time I believed it (that, and I didn't really fancy giving up pizza for the rest of my life if it worked). If a person has a nut allergy or intolerance and they eat that food - immediate reaction. Why could it not be the same reaction to the hormones in dairy products? I have noticed that after slipping up and eating a big wad of cheese with dinner, within 24 hours I notice spots beginning to form on my face. Call it coincidence - I call it a miracle that I've finally found my cure. The hormones in milk are designed to turn baby cows into big fat cows, full of growth hormones and nasty stuff we shouldn't be ingesting - look it up, try it out, see the results, switch to soya and sorbet and never look back. Good luck. Hallelujah!